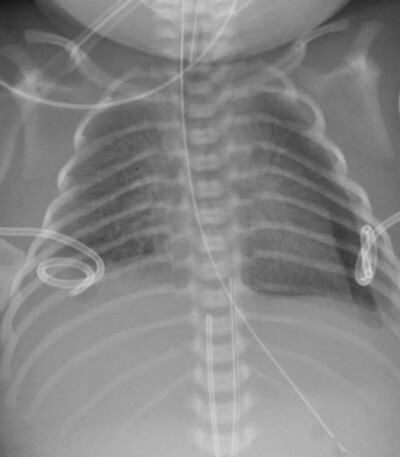 Abstract: Congenital chylothorax (CC) is the most common cause of pleural effusion in the perinatal period. The etiology is unknown in the majority of the cases. However, in some cases, it can be associated with various syndromes and genetic conditions. CC is associated with a high mortality rate. Most of the clinical manifestations are secondary to pressure effects (pulmonary hypoplasia) and loss of protein and lymphatic fluid (hydrops, malnutrition). Conservative management in the neonatal period is effective in up to 80% of cases and includes pleural drainage, parenteral nutrition/enteral medium-chain triglyceride-based formulae, and medications such as octreotide. Surgical intervention (pleurodesis, thoracic duct ligation/embolization, pleuroperitoneal shunt) may be required in persistent cases. A universal consensus on management of CC is unavailable, and data on the safety of medication use for CC in neonates are sparse.